It was 1973, my daughter was almost four-years old and my eldest son almost two when tragedy struck in a neighborhood not far from us. Breaking news came in the form of the newspaper thrown in our driveway every morning and the local news on a local station at six o’clock each evening. A father had fatally run over his little toddler boy in their driveway. I went to see my Grandma Emily that day to ask her how a parent ever got over such a horrible thing? How? That wisdom and compassion came from an experienced heart. A heart and mind that had needed that kind of grace when her only daughter tragically died of cervical cancer at 26 years of age. That kind of grace when she sequestered herself in her ceramics studio for five years, having it out with her God and grieving away the hurt and disappointment and anger and pain. I never want that kind of grace. My heart wretches and my eyes cry over tornadoes, bombings, school shootings. And I am amazed when I hear the stories that come out of the rubble, the amputations, the premature deaths. I am assured that kind of grace abounds, over and over and over and over. And, I am convinced, that kind of grace is enough. I never knew that about Great Grandma. 🙁 However I do remember having that same very conversation with my mother. I’m not real sure how it came up but my mom told me that very same thing. God gives Grace when needed and we can never put ourselves in their place because we haven’t been given that kind of grace. I keep that in mind as I pray for the families, victims and survivors of such tragedies. Susie, you have hit home again. My daughter’s friend has several HUGE issues on her plate, and my daughter was asking “How can one person take so much?” Grace is the answer. Thank you, again, my friend. Beautiful written, I’m posting this on Facebook. So very True. Our Lord’s Precious Grace, when we need it, only with him. Oh Susi, you look like your grandmother, Yes! you do honey! I think I love that lesson from Grandma more than any other one. And I have shared it with many…yes Chrissie that is where I got it! My own Mom had that “dying” grace the night before she went home to heaven. We could all see it. She wasn’t afraid, she wasn’t confused — she just had it! And we as her family had our own “grieving” grace to get thru it. We were able to laugh at her Memorial service and even the youngest of the grandchildren could laugh and enjoy the memories their Aunt Deb had put together for us about Ga, Grandma, Ma. 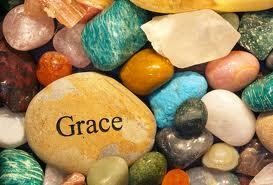 GRACE — it is amazing and if we look for it every day, we wll find it. Weeping may endure for a night but joy [and grace] comes and will come and will continue to come day after day, night after night, incident after incident, in the morning. Such valuable words………thank you, Susan! I think about Great Grandma and that grace lesson often. I think she had so much courage to come out of the basement. Grace.